Why Do We Recycle Metals? In addition to a financial incentive, there is also an environmental imperative. The recycling of metals enables us to preserve natural resources while requiring less energy to process than the manufacture of new products using virgin raw materials. Recycling emits less carbon dioxide and other harmful gasses. More importantly, it saves money and allows manufacturing businesses to reduce their production cost. Recycling also creates jobs. Nearly 40 percent of worldwide steel production is made using recycled steel. Around 42 percent of crude steel in the United States is made of recycled materials. In the United States alone, around 100 million steel and tin cans are used every day. Steel and iron are the most recycled materials in the world due in part to the opportunity to recover large structures as well as the ease of reprocessing. The use of magnets in the sorting process enables recyclers to easily separate them from the mixed waste stream. Every year, around 400 million tons of metal are recycled worldwide. Currently, the single most recycled consumer product in the U.S. is the aluminum can. Throwing away a single aluminum can waste energy equivalent to the same can filled with gasoline. On the other hand, non-ferrous metals include aluminum, copper, lead, zinc, and tin. Precious metals are non-ferrous. The most common precious metals include gold, platinum, silver, iridium, and palladium. The collection process for metals differs than that for other materials because of higher scrap value. As such, it is more likely to be sold to scrap yards than sent to the landfill. The largest source of scrap ferrous metal in the U.S. is from scrap vehicles. Other sources include large steel structures, railroad tracks, ships, farm equipment, and of course, consumer scrap. Prompt scrap, which is created in the course of new product manufacturing, accounts for one-half of ferrous scrap supply. Sorting involves separating metals from the mixed scrap metal stream or the mixed multi-material waste stream. In automated recycling operations, magnets and sensors are used to aid in material separation. At the entrepreneurial level, scrappers may employ a magnet, as well as to observe the material color or weight to help determine the metal type. For example, aluminum will be silver and light. Other important colors to look for are copper, yellow (for brass) and red, for red brass. Scrappers will improve the value of their material by segregating clean metal from the dirty material. To allow further processing, metals are shredded. Shredding is done to promote the melting process as small shredded metals have a large surface to volume ratio. As a result, they can be melted using comparatively less energy. Normally, aluminum is converted into small sheets, and steel is changed into steel blocks. Scrap metal is melted in a large furnace. Each metal is taken to a specific furnace designed to melt that particular metal. A considerable amount of energy is used in this step. Still, as mentioned above, the energy required to melt and recycle metals is much less than the energy that is needed to produce metals using virgin raw materials. Based on the size of the furnace, the degree of heat of the furnace and volume of metal, melting can take from just a few minutes to hours. Purification is done to ensure the final product is of high quality and free of contaminants. One of the most common methods used for purification is Electrolysis. After purification, melted metals are carried by the conveyor belt to cool and solidify the metals. In this stage, scrap metals are formed into specific shapes such as bars that can be easily used for the production of various metal products. Once the metals are cooled and solidified, they are ready to use. They are then transported to various factories where they are used as raw material for the production of brand new products. When the products made of these metal bars come to the end of their useful life, the metal recycling process cycles again. 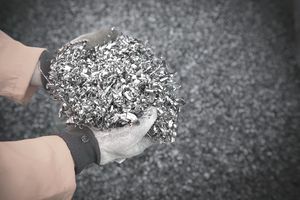 The current overall metal recycling rate of around 30 percent is not acceptable, given the recyclability of almost every kind of metal, and challenges remain with respect how to recapture more material for recycling. The expansion of community recycling programs and public awareness help in this regard. Another important reason for the low recycling rate has to do with the design of various metal products. The growing complexity of various modern products and their material mix makes recycling increasingly difficult. For instance, a simple mobile phone can contain as many as 40 different elements. So, extracting every kind of materials from a mobile phone and reusing them in the production of new products makes it difficult. Modern recycling technologies can effectively identify many different kinds of metals, though there is still the need for even more effective recycling technologies to separate non-ferrous metals. Separating ferrous metals from non-ferrous metals is one of the most important steps in the sorting process. As ferrous metals contain iron, they are attracted by magnets and easily pulled out of the mixed waste stream. In scrap yards, cranes fitted with an electromagnet can remove larger pieces of ferrous scrap. When sorting metals from a mixed stream of recyclable material, the paper is removed first, leaving only plastics and metals. Then, electric currents are induced across the stream where only metals get affected. This process is called Eddy Current Separation. Although aluminum is not magnetic, this technology can levitate it and allow plastics to drop out of the process. Recovering precious metals such as palladium, platinum, gold and other valuable metals such as copper, lead, and silver from electronic waste becomes economically viable only if enough scrap is collected. Such separation takes more technologically advanced and sophisticated recycling equipment. These days, in large recycling facilities, the use of sensors to identify metals through infra-red scanning and x-ray has become popular. Three common categories of metal sensing processes include biotechnology, hydrometallurgy, and pyrometallurgy. The use of these technologies can effectively improve metal recovery rates. If you are looking to set up a metal recycling-related business in the U.S., you should know relevant recycling laws in your state. This interactive map allows you to find metal recycling laws pertinent to every jurisdiction. ISRI (Institute of Scrap Recycling Industries Inc): ISRI is the largest trade association for businesses related to recycling. It represents over 1600 for-profit companies from 34 different countries worldwide. BMRA (British Metals Recycling Association): BMRA represents over 300 scrap metal recyclers of UK and is the leading trade association in the UK. AMRIA: AMRIA refers to Australian Metal Recycling Industry Association. CARI: CARI stands for Canadian Associations of Recycling Industries. It has 250 member companies. Being a member of trade associations in the recycling industry enables a new recycling business to know and understand the trends in the industry and maintain a good relationship with other businesses in the industry.